The thing is that, by happening to Khizr Khan, it has happened to you and me. Mr. Khan says he was informed that, according to a Reuters story published by the New York Times, his “travel privileges” are “under review” in some undefined fashion, by some unnamed entity of the United States government. Khizr Khan has been a U.S. citizen for more than 30 years, and no one is claiming that he has committed any crime. So there are two conceivable reasons for his “travel privileges” being “under review”: He is Muslim, and he has remained outspoken in criticizing Donald Trump. In other words, he simply is who he is – a Muslim (whatever that means in terms of his personal beliefs is not relevant) – and he is committing a very basic American act: exercising his constitutionally guaranteed right to free speech. This matters to you and me very directly. If Khizr Khan is not free to speak his mind or to travel, then neither are we, whenever the regime might decide that we are not. But we are free even so – if we’re willing to pay the price of freedom. The basic equation is that neither a society nor the individuals who comprise it can ever have either complete freedom or complete security. The best we can manage is a judicious blend. Which do you value more highly? Freedom to travel itself might or might not rise to the level of a right (rather than a privilege, as the government is pointedly asserting to Mr. Khan). But restricting freedom to travel for political reasons directly diminishes and endangers citizenship – not only that of the specific citizen targeted, but of us all. If they can do it to Khizr Khan – who, again, has been a U.S. citizen for more than 30 years – they can do it to you or me. And restricting citizens’ freedom to travel for political reasons is exactly what the Soviet Union did. Do we want America to be like the Soviet Union? Khizr Khan’s son Humayun was an American hero in a straightforward, explicit way that should be easy for any of us to recognize and acknowledge: He was a brave soldier who died fighting in Iraq. What Mr. Khan himself, and his wife Ghazala, did at the Democratic Convention last July – brandishing a copy of the United States Constitution from the podium – is every bit as patriotic and heroic as anything their son did. Indeed, they did what they did to honor him and what he did. Khizr Khan is highly respected by his fellow Pakistani-Americans; I know this, because many of them are my friends. He should be respected and appreciated by all Americans. But his forthrightness makes many of us uncomfortable because it forces existential questions: What is America, anyway? Do we as a nation stand for anything other than brute power? Is the Constitution meaningful and operative? Or is America merely – as fellow Blue Ear Books author David Howell recently told us his students tend to believe – the swath of territory between Canada and Mexico? Mr. Khan’s status in the Pakistani-American community is personal to me because I know and appreciate that community personally, on a human level. And I know many Pakistani-Americans on the level of human friendship because, more than twenty years ago, I went to Pakistan and got to know that flawed but interesting country at first hand. To drive the point home: I was able to visit and, later, to live briefly in Pakistan because I was free to travel. And then I was able to write a book and many articles about my very great fondness for Pakistan and Pakistanis. Freedom to travel – to get to know and communicate with other human communities – is a moral and political good that it behooves us to make use of. And freedom to travel is directly connected to freedom of speech. And you can look up freedom of speech in the Constitution, as Khizr Khan has done. 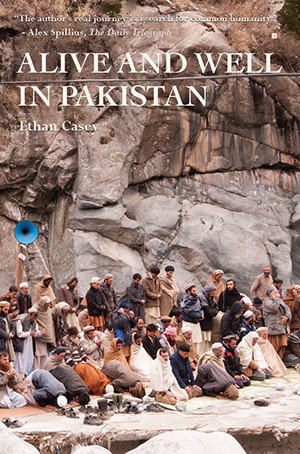 Ethan Casey is the author of Alive and Well in Pakistan: A Human Journey in a Dangerous Time (10th anniversary edition, 2014) and the publisher of Blue Ear Books. His past Blue Ear Books blog posts are archived here.